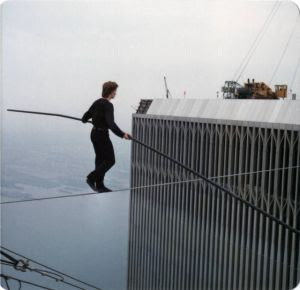 The documentary "Man on Wire" - the story of French high-wire artist Philippe Petit and his walk 1,350 feet above ground between the Twin Towers of New York's World Trade Center on August 7, 1974- has been called a delicious heist film with "Mission: Impossible" moments. Director James Marsh, who says he set out to make a gripping suspense film more than a standard documentary, is not only fine with Hollywood powerbroker Robert Zemeckis and his production company Imagemovers acquiring the story; he encouraged Petit to make the deal. "Making a documentary is not a way to become rich I can tell you that," says Marsh. "Robert Zemeckis is going to do a fairly big, expensive and very advanced film with Philippe. It's a different kind of film that looks at Philippe's adventure in a different kind of way." The idea of another crack at helping retell the "artistic crime of the century," perhaps in Zemeckis' trademark motion-capture technology, sounds interesting. But Marsh is already at work on his next project, an independent drama about Britain's Yorkshire Ripper. "This is a story with enormous universal appeal and has endless possibilities. You can make it as a stage play, like a one-man show or on and on." Despite the big-budget allure, Marsh says his time with Petit is over. "I've done my thing with it and it was a very enjoyable film to make and it was year of my life happily spent making the film but I wouldn't want to do it again or repeat it."